One of the great pleasures of gardening is to see a plant flowering in your garden that you’ve raised yourself from seed, a feeling only bettered when that plant is from seed you’ve collected yourself. When you want to spend a short time in the garden but are not feeling up to anything arduous, seed collecting is the perfect activity. It can be done throughout the year but especially now when there are lots of seedheads waiting to be gathered. Because many annuals and biennials that are meant to seed themselves about often refuse to, collecting and sowing seed is the way to make sure that you always have those plants. The lacy white flowers of Orlaya grandiflora, for example, are supposed to leave lots of young plants behind at the end of its short life, but it never has in my garden. Fruit and vegetable seed can also be collected for sowing the following year. You can even collect the seed from trees and shrubs, but you will have to be patient while you wait for it to germinate and then grow into a large specimen. Not all perennials are long-lived and some, such as the beetroot-coloured Angelica gigas, usually expire after the effort of flowering. So collecting seed from short-lived perennials every year and sowing a few means you don’t have to worry if the original plant dies. And it will save you money. Judging just when a seed is ripe needs a keen eye. As with much in gardening, looking at how and when Nature does things can be your best help. Some plants have spring-loaded seed pods that propel their seeds away from the parent plant. Sweet peas have a pod that, as it dries, twists into a corkscrew that will hurl the seed away. The plant will only do this once the seed has ripened, so keep an eye out for when the seed pods are becoming dry and papery. You can then start collecting the seed. Cranesbill, the common name for hardy geraniums, refers to the shape of the plant’s seedpod. The beak of the pod curls up and springs the seed away when it is ripe. Many plants make use of the wind to help them colonise new areas. The blue-flowered annual, Tweedia caerula, has a long thin seed pod that will split open like a feather pillow when the seeds are ripe. 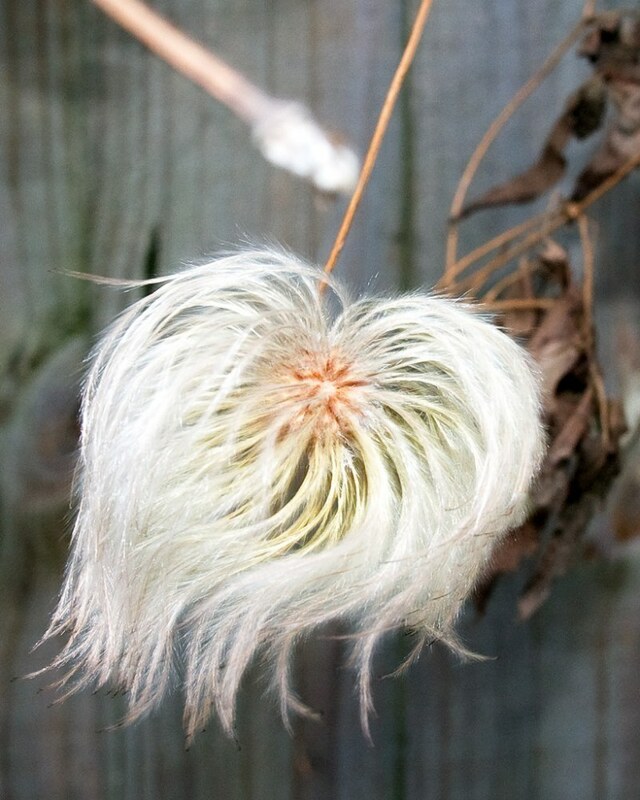 You will never catch the feathery seed wings once they are blowing in the wind, so watch the seed pod after it has formed and collect it as soon as you see a split forming along its length. Daisies, thistles, asters and echinaceas are among the many plants that produce some kind of sail to carry their seed away on the wind. You can generally tell when the flowerhead is about to break open to release the seed. Grab them now before they fly away. The seeds of the scabious family form a tight globe of small parachutes. Press the seed head gently and if the parachutes spring up then they are ripe. Collect them immediately. The most common way in which seed is dispersed is for it to simply drop to the ground when it is ripe. Sometimes the seed pod develops holes, as with poppies, and the seed falls through the holes to the ground when the plant sways in the wind. It takes only a slight breeze to dislodge the seeds of Astrantias. When they are ripe they lie in shallow bowls that are formed from the dried bracts of the flower. Aquilegia seeds are contained in tall goblets that eventually fall to the ground when the stem of the plant rots. When you’ve judged that the seed is ripe wait for a dry day to collect it. Any moisture from dew or rain will cause the seed to rot when it comes to be stored. Some seeds will be ready in June and July, but you can go on collecting through to Christmas. The most useful seed-collecting tool is a large paper bag. On those plants such as hardy geraniums and euphorbias that fling there seeds far and wide, pop the bag over the seed head and quickly tie it around the stem. Any seeds that are shot off by the plant will then collect in the bag. Cut off the flower stem and hang it upside down in a dry room until you are ready to remove your seeds. It’s a good idea to write the name of the plant on the paper bag before using it. Do not be tempted to use a plastic bag as any moisture on the plant will collect in the bag and rot your seeds. You can use the same technique for plants like Aquilegia or Verbena bonariensis which store their seeds in containers. Alternatively hold a clean, dry bowl (a small kitchen basin or a used margarine tub) under the plant and shake the seeds into it. The ripe seeds of most grasses will come away easily from the plant if you gently draw your hand through the flower. The seed usually has a feathery tail attached to it. Put it all, seed and tail, into a paper bag. 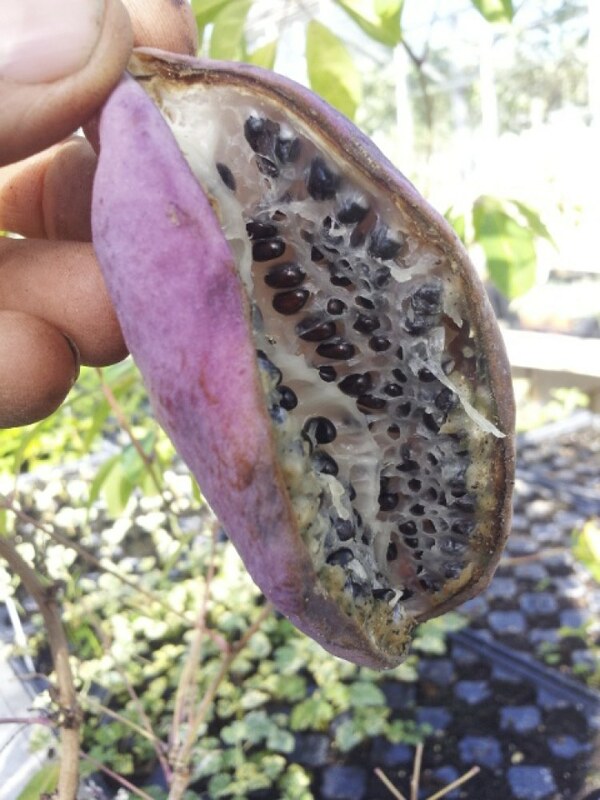 The seed of fruit and berries, here Akebia quinta, needs to be washed away from the pulp and dried. Most of the seeds that you collect will need to be stored until they can be sown next spring. As well as seeds, your paper bags will contain pieces of the dead flower and these need to be removed. If you don’t separate this debris, it can rot and damage the seeds. Work indoors, away from draughts, on a flat surface. Putting the seedheads you have collected on white paper will help you see the seeds and the chaff more clearly. Start by removing as much of the dead flowerhead as you can with your hands. You will then be left with a pile of seeds and dusty chaff. The easiest way to separate the two is to blow gently onto the paper. The seeds are heavier than the dusty remains and you should end up with a pile of clean seeds and a pile of dust. This is known as winnowing. Sweep away the remains and then pour the seeds into an envelope. Don’t worry about getting every last bit of the remains away from the seed – a small but of dirt, as long as it is dry, will do no harm. Write the name of the plant and the date on the envelope and then put it somewhere safe and dry until next year. Old film canisters or resealable freezer bags can also be used for storage. Some seeds come ready-cleaned-with poppies, for example, you can simple shake the seed out of its pod straight into an envelope. Not all seeds are worth collecting. Many annuals and vegetables are F1 hybrids. These are plants whose seed is produced annually by seed merchants crossing two specific plants whose progeny are healthy, vigorous and uniform. The seed from these hybrids will produce very variable results and plants that are often inferior to their parent. Some annual and biennial plants will seed themselves about the garden with no help from you. If you are happy with the places that plants like Love-in-a-mist (Nigella), Sweet Rocket (Hesperis matronalis) and the Californian poppy (Escholzia) choose to seed themselves, there is no point collecting and sowing the seed. Let Nature do the work for you. Only plant species will come ‘true’ from seed – that is, be an almost exact replica of the parent plant. Offspring from seed collected from hybrids and cultivars will not have the same characteristics as their parent. If you want exact copies of a cultivar or hybrid, you have to use a different method of propagation, such as taking cuttings. Some cultivars, though, can produce attractive seedlings. If you want more of a plant, such as one of the red-flowered Astrantias, but are not too concerned to have an exact copy, then collect and sow the seed and see what sort of flowers you get. Some may be greeny-white ( like the original Astrantia major), some pink and maybe some even dark red. It’s pot luck, but you may end up with a plant that you find more attractive than the one from which you took the seed.